Sometimes I get in the habit of burying the lede of a story for dramatic effect. Not this time. My current contract with USA Today ends today, which essentially concludes my association with BaseballHQ.com, the website that I founded over 18 years ago. I will no longer be writing this Fanalytics column, contributing to Master Notes or responding to reader questions on the HQ Forums. You will no longer find my byline on any USA Today publication. I will no longer represent BaseballHQ.com in any official capacity. As of tomorrow, I am a free agent. While this is sad for me, I can't say it is wholly unexpected. When I sold Shandler Enterprises, LLC in 2008, it was part of an exit strategy. I had taken the business as far as I thought I could and wanted to try something new. As it turned out, I still really, really liked to write and opted to reduce my role rather than leave completely. I suppose both Fantasy Sports Ventures and USA Today found that it was good to keep me around for awhile. I am grateful to have squeezed seven years out of those deals. It would have been nice to squeeze out a few more. I am also grateful that I won't be disappearing off the face of the earth completely. I'll still be around to front the Baseball Forecaster and the First Pitch Forum conferences. It's tougher to separate from products often called "Shandler's Book" and "Shandlerfest," I suppose. But my time here ends now, aside from some periodic guest chat appearances. I've been writing about it for the last few weeks. This industry is changing. Companies have to make decisions that best support their goals and growth plans. I've been pretty vocal about my "ambivalence" toward daily fantasy, and it's no secret that my entire career has been based on long-view player analysis. It's nice to be referred to as an industry pioneer but "pioneering" and "full-season fantasy" are not two terms you find in the same sentence much these days. It's funny, but when my leaving BaseballHQ.com became a fait accompli, I briefly considered just playing DFS full-time. I'd probably do well, too. But I've always found that playing for money takes something away from the experience. For me, fantasy baseball was always about the game, the intellectual challenge and the camaraderie. I don't even play in full-season leagues for any substantive cash; I just don't possess the gambling gene. My carrot is the exhiliration that comes with creating a successful new strategy, nailing a breakout performer that nobody else saw coming and grinding out a tough victory. Winning should provide a massive sense of great accomplishment. Picking the right players on one night just doesn't have the same pay-off for me. 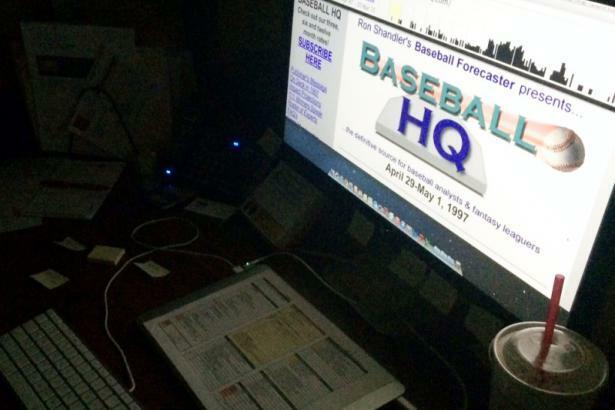 I may be heading out, but BaseballHQ.com isn't going anywhere. I leave this wonderful place in the very-capable hands of Ray Murphy and Brent Hershey. They have been doing most of the heavy lifting for the past few years anyway, and driving all the amazing content here now. They are surrounded by an incredibly talented staff of analysts and writers who keep getting better every year. I feel honored and gratified to have been able to spend the last 18-plus years improving my own game thanks to their insights. In fact, there are writers here who have been with me for almost the entire duration. You don't find that type of loyalty and dedication nearly anywhere else. Thank you, all. And there are readers—you folks—who have been on this ride even longer. The genesis of BaseballHQ.com began with a monthly newsletter in the spring of 1987, expanded to include a weekly fax service run by Rick Wilton, and morphed into a full-fledged website in August 1996 (with the logo you see above). My eternal gratitude goes out to the tens of thousands of readers who have subscribed to the site since then. So, BaseballHQ.com remains strong and profitable, and will do just fine without me. We've built this place with incredibly deep content, both for full-season and now for daily games as well. It's safe. But make no mistake—Ron Shandler is not done. There is a path beyond Mayberry that I'd like to explore, which could give a completely new spin to the whole concept of "targets." What geographic location lies beyond Mayberry? Probably some sort of forest. I've often tossed around the term "pastanalysis," but there is more of a process to the art of throwing spaghetti against a wall to see what sticks. It's all in the thickness of the sauce. I could share some recipes. That exercise we did in the First Pitch Forums spring tour when we projected players blind? While the exercise itself was somewhat simplistic (okay, it was pretty lame), the concept behind it holds greater value in other types of analyses. Regular columns I've written each year here—the Draft Radar pieces, Pundits on Parade, my FSTA/Tout Wars analyses, etc.—will need to find a new home, assuming nobody here picks them up. And I have some early plans to use those as the core for a far more robust treatment next spring. Somewhere. There is not enough "think-tanking" going on in this industry. Peter Kreutzer's spring magazine handles it better than most, but now that I'm independent, I might be in a good position to pull together the industry's top minds for some other ad hoc projects. There is a long-form Q&A format that I may try out, because, well, I'd much rather teach people how to circle hook than to hurl already-grilled halibut at them. If you'd like to send me questions for this exercise, email them to AskRon@ronshandler.com. I'm looking for thought-provoking material, not "Should I cut Andrew McCutchen?" If I don't stop typing now, I'll probably come up with a dozen more. I'm never lacking for ideas. Where will you be able to find all this stuff? You can start in the Owner's Suite at Shandler Park. I've already started stocking it with some notable past works and there will be future links to all my new material. While you're there, you can also try the monthly game, now with BIGGER CASH WINNINGS!. (Sorry, but I still have mortgage payments.) If you'd like me to send you a quick note whenever something new is published, there's a spot on that page where you can leave me your email address. I'm always posting interesting links and discussion topics on my new Facebook page: facebook.com/ronshandler.baseball. "Like" me there. You can also find me on Twitter: @RonShandler. Follow me there. Or heck, just send me an email. If you write to baseballhq@ronshandler.com, I'll know where you've come from. In the future, there could be another website or even another book. And it's possible that some other baseball site may find value in running my byline. I've reached out to a few of my industry colleagues already, but I keep getting asked the same question: "Can you provide us with better DFS content?" Ha! The first thing I'm going to do is take a little time off. My daughter, Justina, graduates from the University of Miami in about a week and then I'll be a heading back to Virginia. We'll be accelerating the downsizing process, which means there are a ton of baseball collectibles, memorabilia and artifacts that I'm going to be selling off over the next few months. Keeping in touch with me will give you a shot at everything from Sandy Koufax baseball cards to Bill James Abstracts and many other items too valuable to give away for free at First Pitch Arizona. My friend and colleague, Ray Murphy, recently admonished me for my attitude about DFS and told me I need to "plant a stake in the ground" when it comes to the full-season game. I suppose I am about as good a person to do that as any, so that will probably be my mission. If our market demographic ages out, as I recently wrote, then I guess I'll just age out with it. I figure I've got another good couple of decades before the shuffleboard courts start to look inviting. But for now, it's time for a celebratory drink to toast the next chapter. I hope you'll join me. It's been an honor and a privilege to build this place and live here for so long. It's an experience I'll never forget. Thank you for reading.